Michell Instruments has extended its range of oxygen analysers with the introduction of the compact and cost-effective XZR200, which offers a great blend of price and performance. It is capable of measuring percentage oxygen to better than 1% of Span (or 0.5% O2) with ranges of 0-25% and 0-100% available. The XZR200 is easy to install and integrate into existing systems as no specialist software is required; the RS232 output can be accessed via a PC. 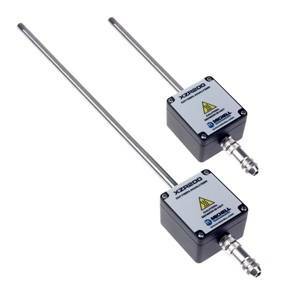 The analyser offers four configuration options, with two choices of probe length and two temperature ranges. The lower temperature range (up to +250°C) is suitable for relatively low-temperature applications such as food and drink packaging, while the higher temperature range of up to +400°C serves combustion control and metal treatment applications. Depending on the application, the XZR200 may also be configured to measure in either 0-25% or 0-100% oxygen concentrations. The first configuration gives the highest accuracy of 0.5% O2 in the combustion process range. In the 0-100% range the accuracy is 1% O2. A key feature of the XZR200 is a 3.3 V DC logic output which is used to monitor the sensor for diagnostic purposes. It’s a way of listening to the sensor’s ‘heartbeat’ and enables the operator to check on the health of the sensor, providing a warning when if there is a fault with the sensor. The lifespan of the zirconium dioxide sensor is between 1 and 7 years, depending on the temperature and type of gas measured.